PORTLAND, Maine -- The most expensive destroyer ever built for the Navy suffered an engineering problem in the Panama Canal and had to be towed to port. U.S. Third Fleet spokesman Cmdr. Ryan Perry said a vice admiral directed the USS Zumwalt to remain at ex-Naval Station Rodman in Panama to address the issues, which arose on Monday. The ship was built at Bath Iron Works in Maine and is on its way to San Diego. USNI News, a publication of the U.S. Naval Institute, reported on its website that the ship was in the canal when it lost propulsion. Crew also saw water intrusion in bearings that connect electrical motors to drive shafts, the website reported. 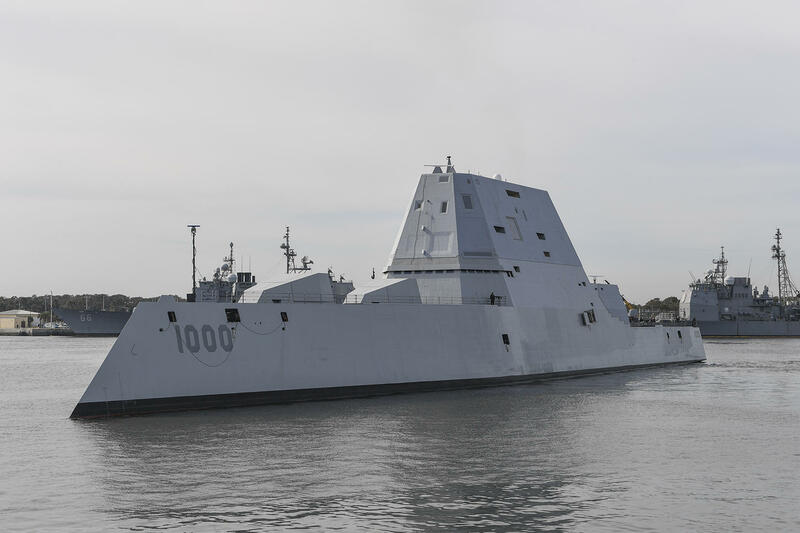 USNI News also reported that the Zumwalt suffered minor cosmetic damage. The ship had been scheduled to arrive in San Diego by the end of the year to start the activation of its weapon system, the website reported. CBS News National Security Correspondent David Martin rode the 610-foot-long USS Zumwalt from Norfolk, Virginia to Baltimore in October. “There’s never been a Navy destroyer like this -- never one that looked like this, and never one that cost so much,” Martin said of the ship, which is the most technologically sophisticated destroyer ever built for the Navy. He said it was designed to be stealthy, and that its sharp angle are meant to deflect radar beams sent out by anyone trying to find it. One of the destroyer’s signature features is a new gun system that fires rocket-powered shells more than 60 nautical miles. Ron O’Rourke of the Congressional Research Service told CBS News the ship was designed to strike targets in a country like North Korea. “With their guns they could reach in from either side of the peninsula, pretty far in, to cover a large portion of the territory of the peninsula,” O’Rourke said. The Zumwalt cost more than $4.4 billion and was commissioned last month in Maryland. It also suffered a leak in its propulsion system before it was commissioned. The leak required the ship to remain at Naval Station Norfolk in Virginia longer than expected for repairs. The second Zumwalt-class destroyer, which also cost more than $4.4 billion, was christened in a June ceremony during which U.S. Rep. Bruce Poliquin called it an “extraordinary machine of peace and security.” The third ship is expected to cost a bit less than $3.7 billion. A spokeswoman for Bath Iron Works said the shipyard was not planning to comment on the breakdown and deferred to the Navy.